Under the reign of two great Assyrian kings known as Ashurnasirpal II and Sargon II they both established prominent capitals a century apart with a common inclusion of a hybrid mythological guardian creature known as the Lamassu. Ashurnasirpal II (reigned 883-859 BC), the first great Assyrian king, constructed a new capital in Kalhu (present day Nimrud) to represent his power and reign over his vast empire. This capital occupied over 900 acres and a mud-brick wall enclosed the southwest corner where temples, palaces, and offices of administrators of the empire were located. At the entrances to this palace complex that was now the capital, there were hybrid supernatural figures with a bearded human head, the body of a lion, wings of a bird, and 5 legs that stood guard at all entrances to the palace; this creature is known as the Lamassu (or Shedu). Often in pairs these human-animal figures, such as the Lamassu, functioned as protective guardians against outside supernatural powers and its 5 legs could be viewed from the front as standing firm with 2 legs planted against a threat or by the side where it is depicted as striding forward against evil with 4 long and strong legs. Alongside with warding away supernatural elements, the massive size of the figure warded away natural forces, such as enemy troops and outsiders, by their imposing presence of standing from 10 to 14 feet tall and to also serve as a clear reminder of the king’s authority over all of his empire. During Sargon II control (reigned 721-705 BC) there were only small changes during his reign. The first change was the capital was moved to Dur Sharrukin (present day Khorsabad) and second the Lamassu was presented on a bull’s body compared to a lions and seems to be slightly smiling. In the Assyrian mythology there were human headed winged bulls/lions that were protective genies. During the 9th century Nimrud Genies were protective, powerful elements placed in palaces to enhance the king’s prestige and power but to also serve as a guardian to him in his most vulnerable states (The Lamassu and Shedu were protective household spirits in Babylon (Pauline). The Akkadians associated the human-bull hybrid as a gatekeeper associated with the god Papsukkal, who is the attendant deity of Anu (sky god of the supreme deities) and functions as a gatekeeper in the spiritual world by providing a pathway between the higher gods and humans (Heffron). While these hybrid creatures were supernatural beings, they were superior to humans but were not considered to be deities. Even though the Lamassu does wear a horned cap/tiara, which proves their divinity, they were not considered deities in their culture. Throughout the reign of Ashurnasirpal II and Sargon II, the construction of a new capital presented opportunities to prove the most important aspects of culture and beliefs of the time. With the geographical differences along with a new ruler, the Lamassu stayed a prevalent part of the Assyrian and Neo-Babylonian culture. Heffron, Yaǧmur. “Papsukkal (god).” Ancient Mesopotamian Gods and Goddesses -. January 1, 2013. Accessed March 12, 2015. http://oracc.museum.upenn.edu/amgg/listofdeities/papsukkal/. Lendering, Jona. 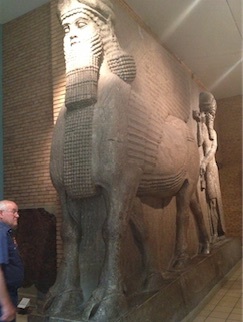 “Lamassu (bull-man).” – Livius. October 22, 2004. Accessed March 12, 2015. http://www.livius.org/mythology/lamassu-bull-man/. Pauline, Albenda. “Work Winged Human-headed Bull.” Winged Human-headed Bull. January 1, 1993. Accessed March 12, 2015. http://www.louvre.fr/en/oeuvre-notices/winged-human-headed-bull.